We advise you to order a sample in the colours you require before making your order. 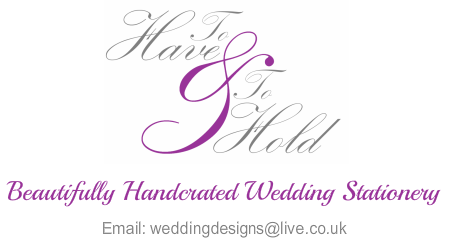 This way you can see what your stationery will look like in your chosen design. Please see our samples page to view the options available. We require a non-refundable deposit of 50% of your total order cost to be paid when you place your order. This deposit is required to confirm your order and must be received before any work on proofs will begin. We accept payment by credit/debit card/paypal (small charge applies), bank transfer or cheque. The remaining balance must be paid once the final online proof has been approved by the customer. The remaining balance is required before work will begin on any wedding stationery. A reminder of this will be sent to you. Postage costs are dependent on the size and weight of your order. We will notify you of the cost of this when we send your final invoice. Please read through our Terms and Conditions before placing an order.